So I have to write about this teething stick! 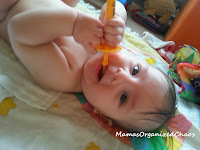 A mama on facebook recommended this as a good item to purchase to help babies through teething. I checked it out and it looked pretty awesome to me as well. I purchased two of them when Caroline was around 3 months old. Caroline was just barely starting to grab at toys, and was having difficulty with most- but not with this stick! Caroline grabbed right on and took this everywhere! She was able to get it in her mouth and chew on it as well! We ended up leaving one in the car, and as soon as we’d put her in the car seat she’d reach out for it when I handed it to her. If we were going on a walk, she held it while she was in her stroller the ENTIRE time. Of course, we also kept one in the house for her to play with as well! Everywhere I went, mama’s that saw this stick were amazed and asking me what it was! I have literally given the information to probably 30 people- some I knew and some were just random strangers that were interested! We love it so much that we bought more! 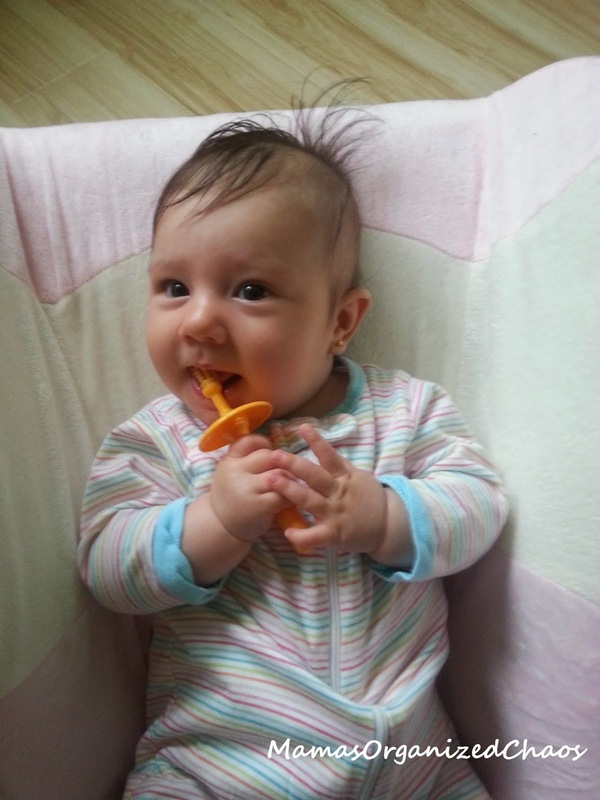 Can I just say that Caroline isn’t even teething yet!?! I can’t imagine how helpful these will be then! The teething rings that go in the freezer were hard for Caroline to grasp at first…some of them are better but the shapes can be odd to hold onto, and she can’t get them into her mouth where she wants them. So she usually just throws it back down. These she can get back far enough to enjoy chewing, but it has an anti-choking ring so she can’t do anything but gag herself…she learned within a week or so not to do that. HERE IS THE LINK to buy them at amazon if you are interested. It is only $10 for 2 of them, which I think is well worth the money! If you are interested in seeing some of the other must haves for baby that I put together, visit my MUST HAVE LIST FOR BABY PAGE!